Lathe-turned and carved in shallow relief mottled steatite of a predominantly beige colour with some patches and lines of purple pigmentation. This relic container was excavated at Stupa 2 at Sonari, a Buddhist monastery six miles south-west of Sanchi, by Alexander Cunningham and F. C. Maisey in 1851. It was found to contain three miniature reliquaries – two in steatite and one in rock crystal - as well as a quantity of powdered bone-ash and a piece of wood. It is shaped to resemble a lotus bud, with incised petals decorating the lower half of the reliquary. It was turned on the lathe and then carved in low relief with bands of lotus-petals on the shoulder and lower part of the body, whilst on the upper body there is a broad zone divided into eight rectangular compartments in each of which is an elephant, horse, deer or winged lion, typical motifs of the Mauryan period. It was first published by A Cunningham in The Bhilsa Topes in 1854. It was customary from the time of the Buddha’s death to preserve and venerate his relics. Under the great Mauryan emperor Asoka (circa 268-233 BC), a convert to Buddhism and an energetic patron of the faith, a series of stupas, relic mounds, were erected across the empire, marking sites of significance in the Buddha’s life. This practice continued, and this relic container is believed to have been interned around 200 BC. Relic deposits of this period usually represented re-deposits of original Buddha corporal relics. 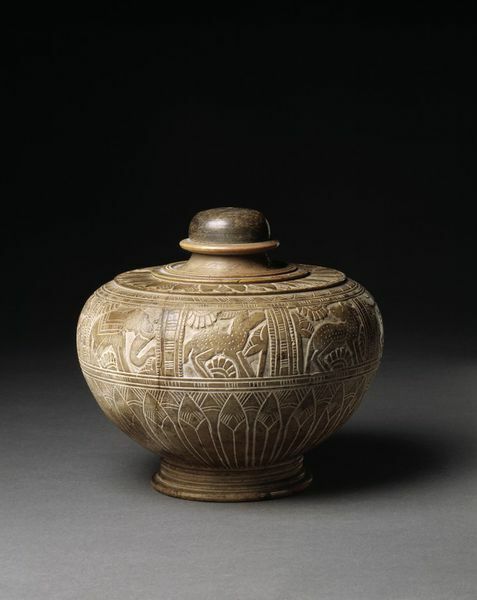 The container has a bulbous shape on a ridged foot with a domed lid. 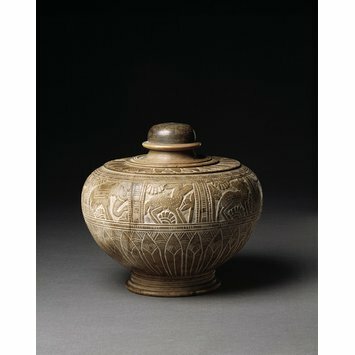 The main body of the vase is divided into two registers with the lower one decorated with an engraved design of lotus petals, also found as a smaller band on its shoulder. The upper part of the body has a wide band of eight rectangular compartments separated by broad vertical incised uprights with upper and lower framing incised bands. The compartments depict various animals comprising elephants, bridled horses, a winged beast and spotted deer set among abstract floral motifs. Recovered from the relic chamber of Stupa 2 at Sonari by Alexander Cunningham and F.C. Maisey during their excavations in 1851. When excavated it contained five small relic caskets, (including IM.220-1921, IM.221-1921 and IM.222-1921 in the V&A's collection and one reliquary in the British Museum) together with beads, a small quantity of bone ash and a piece of wood (possibly sandalwood). The ash and the piece of wood were handed over to Professor M.S. Sundaram, representing the government of India in 1958. Guy, John, Indian Temple Sculpture, London, V &A Publications, 2007, p 30. pl. 29.
in large hemispherical mounds called stupas. resembles that of a full-size stupa.